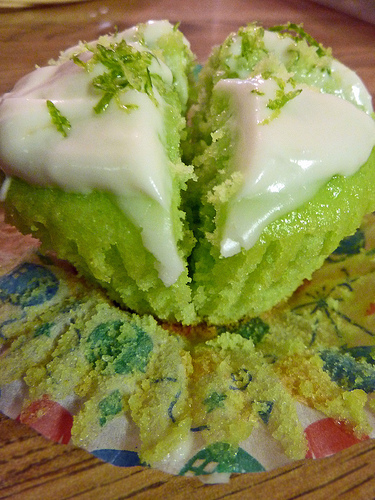 Key Lime Cupcakes bring the tangy and the sweet | write meg! As part of my ongoing quest to make delicious food and, apparently, fatten up everyone in my life (family, boyfriend, coworkers — I’m looking at all of you), I went ahead and got adventurous last weekend: and this time? It was all about the Key Lime Cupcakes. Katie and I decided to throw ourselves a birthday party, see, and what’s a birthday party without dessert? Since it was also a birthday party for several other friends with big days right around ours and I didn’t know how I could possibly fit five names on a birthday cake, I went with the old standby: cupcakes. And, well — I love cupcakes. And I don’t really need any excuse to make them. So I’ve got my little virtual recipe box with all my little recipes. And when I went to pick a cupcake for the party, I wanted something cool, refreshing and different. These fit the bill. Just bear in mind that the “lime” factor of the Key Lime Cupcakes is no joke, so if you just casually enjoy sweet-and-tart desserts? Use caution. I followed this recipe to the letter and wound up with a ton of extra frosting, and I’m not sure that my homemade variety was anything better than what I could have whipped out of a can . 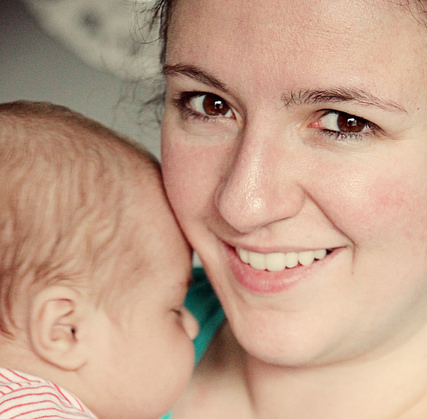 . . but hey, it’s fun to say I made these (almost) from scratch! Next time, though, I think I will use pre-made cream cheese frosting. Especially since I was trying to finish these at 11 p.m. while dancing to Michael Jackson and being a lunatic, and I almost had a disaster going on. Why make it harder on myself? Just don’t skip the lime zest — that really added a welcome kick. 1. Heat oven to 350°F. Place paper baking cup in each of 24 regular-size muffin cups. In large bowl, beat cake mix and gelatin with electric mixer on low speed 30 seconds. Add remaining cupcake ingredients. Beat with electric mixer on low speed 30 seconds; beat on medium speed 2 minutes, scraping bowl as necessary. Divide batter evenly among muffin cups, filling each about 2/3 full. 2. Bake 17 to 22 minutes or until toothpick inserted in center comes out clean. Cool in pan 10 minutes. Remove from pan to cooling rack. With toothpick or wooden skewer, pierce tops of cupcakes in several places. 3. In small bowl, mix 1 cup powdered sugar and enough of the 2 to 2 1/2 tablespoons lime juice until glaze is smooth and thin enough to drizzle. Drizzle and spread glaze over cupcakes. Cool completely, about 30 minutes. 4. In large bowl, beat cream cheese and butter on medium speed until light and fluffy. On low speed, beat in vanilla and 3 1/2 cups powdered sugar until mixed; beat on medium speed until fluffy. Frost cupcakes, mounding and swirling frosting in center. Garnish with lime peel. Store covered in refrigerator. Yield: 24 cupcakes. I LOVE key lime pie so I just might have to give these a try! Holy crap that rhymed! for it? If so can you email it to me? Thank you. These look amazing! I will be sure to try them out! Also, if you want a super easy recipe for a great buttercream frosting there is one I am about to post on my blog. I will warn you it makes an absolute TON of frosting, but it’s so simple and delicious. Plus you can flavor it however you want and just keep it in tupperware in the refrigerator until you need more! These look heavenly! I love lime, so this would be right up my alley! I’m definitely going to give these a go soon! Oh yes. Ohhhhh yes! I need these. Soon. OH MY! Could those cupcakes look more decadent? I don’t think so! I’m going to try and adjust the recipe so it’s gluten-free. Key lime is my favorite flavor of yogurt! I don’t think I’ve had it in pie or cupcake form. Yum! Oh my gosh! These look like the Grinch! I am going to add them to my list – but I still haven’t made the S’mores ones lol! They’re next, then Key Lime! I can always count on your for awesome recipes! Mmm, I bookmarked the recipe when you tweeted it and I must try them soon (not sure how easy it will be to find key lime juice here in the UK but willing to find out!) They are vividly green. Sweet cheezits this sounds awesome! They look great! They’re so GREEN!!!! I know your birthday is coming up because I remembered it’s the same day as one of my sisters! I’ll come back in 3 days for a Happy Birthday wish!!! These look awesome! Not a bad idea for a St. Patrick’s Day dessert 🙂 Thanks for posting this great recipe! My birthday’s in November and I’d like some of these then! they look yummy! These look delicious!! Sounds like a fun time you had baking at 11 pm!! don’t you DARE wimp out and use premade cream cheese frosting!!!! i will hunt you down! 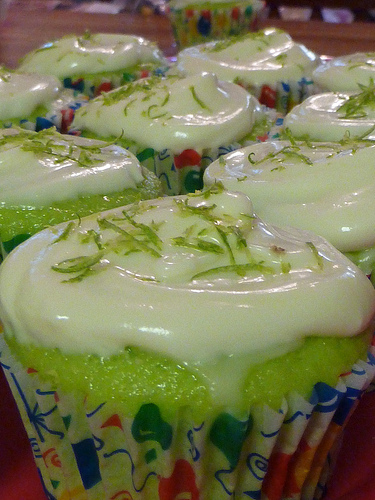 but i’ve never made key lime cupcakes. i’ll be honest, the green-ness freaks me out a tad. but the icing? i’d lick that off in a SECOND. yum. you’re such a betty crocker. soon you’ll have a cooking blog with spencer. I laughed at what Natalie said! Try considering the idea Meg? I’d LOVE to try this but BC has yet to make anything in their Gluten Free line except Devil’s and Yellow cake mix. Maybe I can experiment with that anyway! I recently had an outdoor party with a taco bar and other Mexican-inspired foods. I made these cupcakes for dessert using the recipe from the Betty Crocker June magazine issue of “Summer Appetizers” and everyone raved about their flavor. I made mine in mini cupcake pans and the recipe did not call for using the glaze mentioned above, but all the other ingredients and directions were the same. I have given out this recipe three times in the last two weeks! These look absolutely fabulous! Key Lime is a favorite in our house! Can’t wait to try this recipe! I love anything key lime – reading the recipe and looking at the pics, my mouth is watering. I’m not the cook, hubby is, but I WILL make these. So glad you posted. Thanks. Yummy!! I’ve got to try these…mini cupcakes here I come!!!!!! SOUNDS REALLY GOOD HAVE TO TRY IT!! Looks good going to try to make them for my son, He likes key lime pie. I am excited to try the Key Lime Cup Cake recipe, I really like Key Lime Pie, hope this is as good. My youngest G/Daughter is turning 16 in Aug. and I thought these would be perfect as the Gem stone for Aug is Peridot (it is sort of an lime green) so maybe these would work very nicely at her party!!!! These look great! My mouth is watering. I will be making these as soon as I get the ingredients… Thanks for sharing. Just found your blog through a friend of mine. These cupcakes look so different, interesting and best of all scrumptious. Thanks for passing along the recipe. Going to make these RIGHT now!! But, I only have sugar free jell-o. Do you think that’ll be okay? Thanks! Go for it, Kim! I don’t think the sugar-free Jello will hurt the recipe at all. Pingback: If you like piña coladas (in a cupcake…) « write meg! Can these be made as a cake? I have 2 birthdays next week and need a birthday cake I can decorate with writing. Will this icing harden enough to do that?